Early in February Joie Jacobsen www.joiejacobsen.com sent out the following statement to invite people to attend the RPA Annual teleconference that Gladys Murphy www.hramembers.org/Practitioners/GladysMurphy.asp and she were creating. Joie, is the person who introduced me to Cyndi Dale’s work and the tenth chakra information that I continue to use. (As I have mentioned in an earlier post, Carol’s talk along with the The Loving Heart Repatterning; Entrainment with the Universal Heart written by Carol, Joie Gladys are available at www.hramembers.org). Today is the day that the progression towards Unity Consciousness accelerates. If you would like to participate and to learn more here are a few links to help you on your way. Again, as Joie pointed out if you go to treeof lifecelebration.com you will be sent to http://doasone.com/default.aspx where you can enter the breathing room, the laughing room, the om room and the conscious breathing room. These are all very cool places where you can see how many people in which parts of the world are with you right then. So Happy New Ninth Wave to you all! 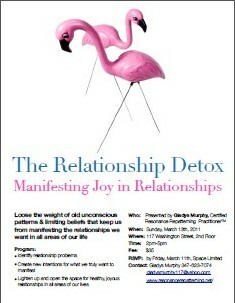 The Relationship Detox this Sunday, March 13, 2011 from 2-5pm in her office a few minutes away from the PATH train in Hoboken, NJ. The investment is $35.00 and pre- registration is necessary. For anyone who does not know Gladys, know that she is a gifted, sensitive empathic and powerful Certified RR practitioner. You will be so glad that you have journeyed with her! For registration by Friday, March 11th and more details you can contact Gladys at gladysmurphy117@yahoo.com.